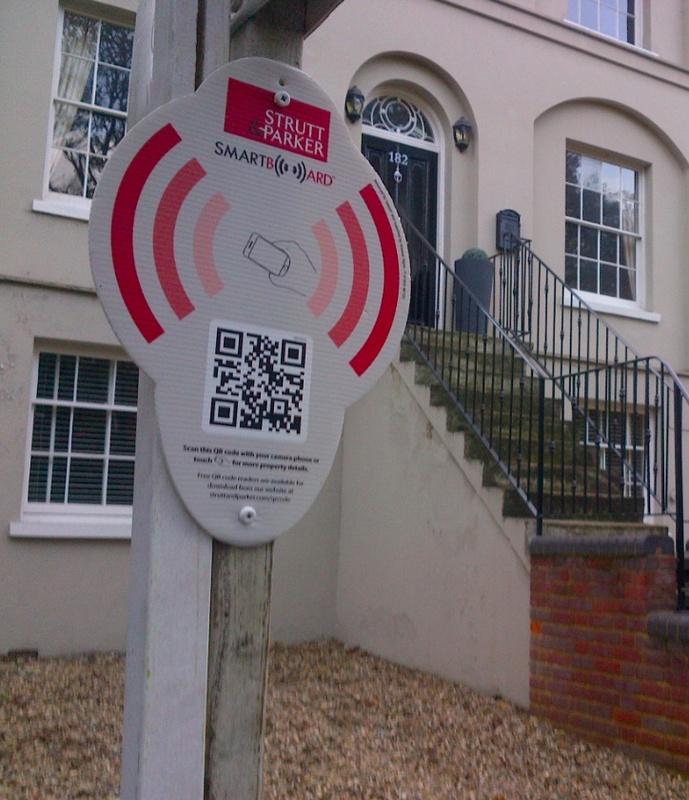 What are QR codes, and do they have a role in property marketing? QR codes, or Quick Response Codes are defined as a “two dimensional matrix barcode consisting of black modules arranged in a square pattern on a white background.” You will undoubtedly have come across them either in display advertising or shop windows. They were originally developed by a subsidiary of Toyota to allow for the tracking of vehicles during the assembly process as the codes can be read at very high speed. Their use is free of any licence and there are numerous site on the web that provide QR code generators for free, and free QR readers are available to download for most smartphones (see below for links). They have become increasingly popular in marketing circles as the scanning of a code by a QR enabled smartphone can quickly direct the user to a website, a video, or can even initiate an email or telephone call. The “quick response” saves all the hassle of having to punch in a lengthy URL into your browser, or an address into your email client and allows a print advertiser to get more bangs for their bucks if they can entice the reader into their website or video stream. They have become widely adopted in the US for the residential market and it is very common to see a sign with a QR code stuck on a lawn outside a property for sale. In the UK the internet chatter amongst residential Estate Agents suggests that they are being enthusiastically embraced and the UK’s leading residential portal Rightmove are now offering QR codes to all their members. One problem is that as each QR code is unique, a unique sign board has to be created for external marketing. This can be overcome by creating stickers to attach to your existing boards however this being the UK, and with our weather system, there have been complaints that such stickers don’t often stay on the boards for long. Strutt & Parker claim to have nailed this particular problem using sign boards that also have a NFC (near field communication) chip embedded in them. Looking to overcome this issue is Tag Street, an innovative company who provide a small sign or ”smartboard” that can be tacked on to an Agent’s pole and they only charge on a pay-per-view basis. It therefore seems that the UK will be following the US in adopting QR codes for residential property but it remains to be seen whether there will be the same enthusiasm for commercial. However given that smartphone adoption is likely to exceed 50% of all mobile phone users in the UK by the end of 2012, and that QR codes are free and an open standard, there is a marketing opportunity here for those who think creatively.